dej2 I have an auntie that is interested in learning Go (Weiqi) she only reads Chinese. 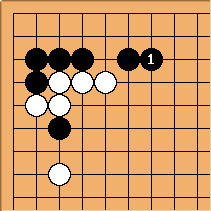 Does anyone know of where I can find a pdf that has the rules of Go written in Chinese? All my sources are only in English. unkx80: Must it be pdf? If not, there are many good Chinese websites out there that offer rules. One such website I recall offhand is http://www.weiqi.org.sg/chinese/howtoplay.asp ... definitely not the best one, but one you can start with. Velobici: Can you help me with 并 / 並 and 长 / 長 ? both are listed as stretch...is there a difference between the two terms ? unkx80: You have been asking a lot of good and challenging questions. Typically, 长 refers to any kind of stretch, while 立 is restricted to a stretch in a vertical direction w.r.t. the edge of the board, and 并 is restricted to a stretch in a horizontal direction. here qualifies as a 长, but is more often referred to as 并. Please provide a concise translation in English, thank you. unkx80: I guess some of these are related to the bent four in the corner. tderz Yes, all were from a page concerning bent-4 positions. tderz Is 骗着 (騙著) pià® zhāo - trick play = hamete? unkx80: If I want to give a simple answer, I would say yes. According to the trick play page, a hamete is a trick play in the opening; and according to the hamete page, the term hamete is often imprecisely used for any trick play. From my understanding, 骗着 / 欺着 can be used for any trick play. However, it should also be commented that most of the time (maybe more than 90%? ), when 骗着 / 欺着 is used, it is used in the context of the opening. I don't think there is a single Chinese "word" that exactly describes hamete, unless you qualify it with something like 布局 / 定式. I would like to know more about the latest (massive) editing at (version 215 last modified on December 6, 2006 - 02:32) by nando. The total diff is zero, some checks - at random - have not shown me any difference. May I ask 'Has anything been changed w.r.t. the diacritical markings?'. Did you have a display problem? I am just worried, that ^some content may have changed & I have to check it all again. It is useful to indicate reasons a/o effects in the small field 'Short summary of change'. nando: I should have been more specific, sorry. unkx80 is correct, I only did a "search/replace" targeted at those accentuated characters, following complaints on the MessageBoard. My personal opinion is, that method (A) is easier for most Westeners, including me, as one starts looking up one character first, then its combinations. There are even less favourable methods for us Go players thinkable (as in ISBN 0-19-860258-8, which is a very versatile book! ), which disregard the pinyin for ordering the entries. As non-sinophone Go players our usual aim will be to decipher the meaning of a character (or its combination) encountered in a Go book (while nobody pronounced the word for us!). Hence, I prefer method (A) above.